By Fred Palumbo, New York World-Telegram & Sun Collection, Library of Congress. "Ann Landers" was a pen name created in 1943 by advice columnist Ruth Crowley of the Chicago Sun-Times. 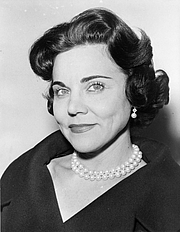 It was taken over by Eppie Lederer in 1955 and she produced the Ask Ann Landers syndicated column for about 50 years. The column continues to be a regular feature in many national and local newspapers in North America and the name "Ann Landers" has entered the cultural lexicon. Eppie Lederer's twin sister Pauline Philips wrote the "Dear Abby" advice column under the pseudonym Abigail Van Buren. Ann Landers is currently considered a "single author." If one or more works are by a distinct, homonymous authors, go ahead and split the author. Ann Landers is composed of 3 names. You can examine and separate out names.